. : Optics & Photonics Focus :: Spying on Living Cells :. The displays of the future will be stretchable, twistable, deformable into any shape, and, perhaps more importantly, durable, efficient, and cheap. This is the promise of a new approach for manufacturing inorganic light emitting devices (ILEDs). Undercover agents have been using tiny spy cameras for decades. Now, thanks to nanotechnology, researchers can also go undercover and spy on living cells from the inside. A cellular spy cam. The nanowire in the center channels light into a living cell. This light can excite fluorescent markers inside the cell and otherwise be reflected back into the nanowire. A detection system then allows us to capture the light and thus to gain insight into processes inside the living cell. Illustration: Yang group. 10:30AM - Covert agent enters premises. Suspect is unaware of investigation. 10:35AM – Spy cam enabled. Recording initiated. The opening scene from a James Bond movie? Or just another working day in the labs of the international team led by Peidong Yang from the University of Berkeley, USA? Starring: a biological process inside a living cell as the suspect, and a nanowire carrying optical information as the agent that uses, for a spy cam, a high-tech optical setup capable of illuminating parts of the cell and recording the cell’s response. Yang’s device allows for precise, non-invasive studies of intracellular processes, which may soon lead to a deeper understanding of cellular functions, and provide a framework within which new cell experiments may be performed. For decades, miniaturization has been a key driving force of technological innovation. Miniaturization of electronics has fueled breakthroughs leading to ever more powerful computers and mobile devices. This has ultimately reshaped the world as we know it. Today, many researchers around the world are studying the research and technology potential of miniaturized optical devices. In fact, recent technological advances have laid the foundations for this type of nano-optical components. Not surprisingly, this has opened up new challenging fields of research that may soon become accessible with new nano-optical tools. In recent years, biological processes have received increasing attention from the research community working in optics and photonics. After all, biological systems are tremendously complex, sensitive, and interdependent: conventional studies using cryogenic temperatures, vacuum, or high doses of aggressive X-rays cannot be used to study living organisms. The study of cellular functions should be performed in conditions that are most similar to those in their natural environment: at room temperature, at normal atmospheric pressure, and employing techniques that do not alter intra-cellular processes. "The key point," says Peidong Yang about their setup, "is non-invasive, precise point delivery of cargo, and highly localized excitation and imaging capability." Thus, their nanoscale endoscope serves as a precise tool for using light inside a cell without significantly interfering with cellular processes. Peidong Yang and coworkers have used nanowires to look inside a living cell. Key to their approach is a tiny wire of tin oxide which enters the cell and channels light to and from the cell. Thus, they are able to shine light into the cell with great accuracy. The light inside the cell can then excite fluorescent markers inside the cell, and the fluorescence can be channeled back from the cell to a measurement device via the nanowire. 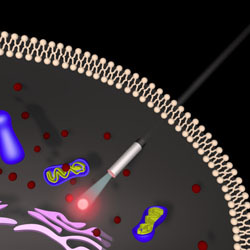 The main novelty of this work, according to Younan Xia [1,2] from the Georgia Institute of Technology, USA, is "the development of a nanowire-based probe that can be inserted into a living cell and be used to collect, guide or even detect optical signals and at the same time deliver various chemicals. Of course, similar types of probes or devices have been reported before, like those based on carbon nanotubes for delivery purposes, and those based on pulled glass capillaries for both optical detection and delivery." Thus, in this very active field, several approaches are currently being studied. One key aspect of their approach, according to Yang, is the mechanical stability of a nanowire. Therefore, cellular forces will only have minimal impact on their device. At the present stage, single cell endoscopy is closer to basic research than to commercial application. "The major issue in cellular imaging," Xia says, "is the resolution, both spatial and temporal. Most optical imaging tools, of which confocal microscopes are an example, can barely resolve the detailed structures of organelles inside a cell. It would be nice if we could resolve their structures and positions while keeping them intact, because then we can obtain a lot of useful information, including how they respond to external stimuli etc. This has been a long standing goal in this field and I am not sure if it can be resolved in the next 25 years." Nonetheless, asked about the potential impact of single cell endoscopy, Xia suggests that its imaging capability could also be demonstrated by employing near-infrared light to reduce possible damages to the cell compartments. He adds that it could now be applied to show the identification of different organelles, to monitor their changes in response to different stimuli, or to study other phenomena that have not yet been demonstrated with other techniques. "The most fascinating part," Yang concludes, "is that we are finally at the stage where we are able to use this nanoscopic light source in a solution environment to probe and spy on a single living cell. This tool would enable one to deliver cargos (QDs, protein, DNA) with precision while watching what happens immediately afterwards in situ." E. C. Cho, Q. Zhang & Y. Xia, The effect of sedimentation and diffusion on cellular uptake of gold nanoparticles, Nat. Nanotech. 6, 385-391 (2011). L. Tong, C. Cobley, J. Chen, Y. Xia & J.-X. Cheng, Bright Three-Photon Luminescence from Gold/Silver Alloyed Nanostructures for Bioimaging with Negligible Photothermal Toxicity, Angew. Chemie Int. Ed. 49, 3485-3488 (2010). Ruoxue Yan, Ji-Ho Park, Yeonho Choi, Chul-Joon Heo, Seung-Man Yang, Luke P. Lee & Peidong Yang, Nanowire-based single-cell endoscopy, Nature Nanotechnology (2011) , doi:10.1038/nnano.2011.226 (link).